At the 2011 Seoul Motor Show Hyundai Motor staged a world premiere of the Hyundai Blue2 concept car (codenamed HND-6), a mid-size FCEV which shows a blueprint for future sedans. The name 'Blue2' is a combination of Hyundai's sub eco-brand 'Blue Drive' and the number `2' from H2, the symbol for hydrogen gas. 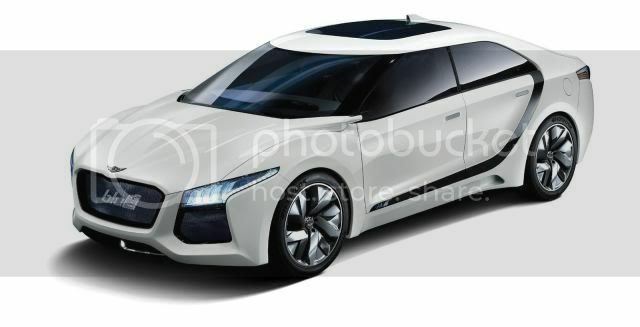 Aiming at gaining early leadership of the FCEV market, Hyundai Blue2 concept is powered by a fuel cell electric system that delivers a stack power of 121bhp (122PS/90kW) (1.65kW/L) and fuel economy of 100mpg (34.9km/l). The Blue2 is materialized in a sporty and luxurious style, a combination of futuristic, flowing designs and eco-friendly features. The Hyundai Blue2 concept is equipped with low-resistance tires and alloy wheels which are designed to improve aerodynamic performance, while the car's interior design encompasses a futuristic look by using eco-friendly new materials. 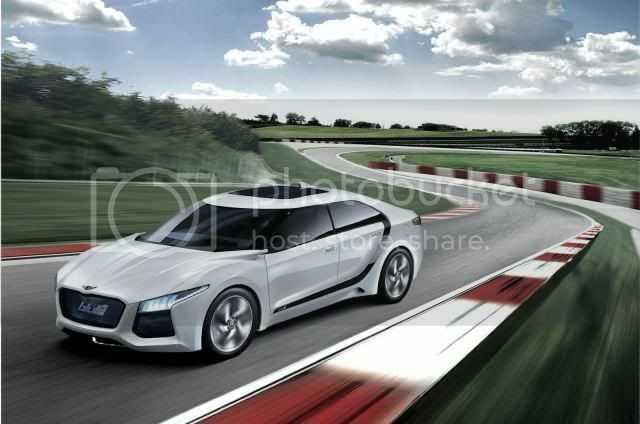 Hyundai's concept keywords for the exterior design are 'Intersected Flow,' featuring innovative and dynamic designs. The vehicle's condition is visible via unique and futuristic images on the exterior of the car through outside LED screen panels, which are located on both the front and rear of the car. Blue2 also features a welcome system which recognizes the driver, while an automatic opening door system enhances the driver's convenience. Conventional side mirrors are replaced by side cameras and a roof camera, offering a state-of-the-art driving environment. The exterior designs flow inside the vehicle, with asymmetrically-designed dashboards and doors to optimize a driver's convenience and add emotional value. Wider seats enable people to get in and out of the vehicle more comfortably. 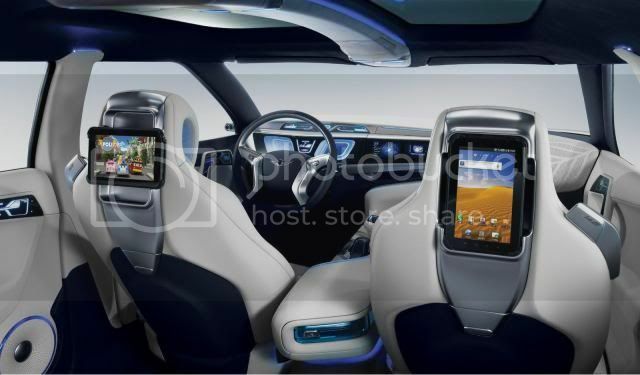 Hyundai combined the cluster and center fascia, applying an advanced Transparent Organic Light Emitting Diode (TOLED) monitor and ultra-light tempered glass, called Gorilla® Glass, providing more accurate and vivid graphic information. The infotainment system is operated by a Motion Sensor Moustick, a haptic wheel and motion sensor that respond to the driver's touch and hand movements, respectively, giving drivers a new experience. 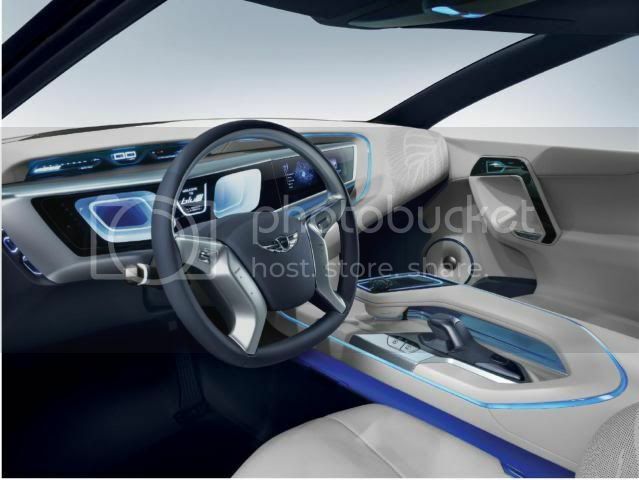 Hyundai Blue2 concept aims to satisfy all the senses of future drivers, including the air they breathe: A cluster ionizer freshens the air inside the vehicle, while antibacterial genuine leather with leaf-shaped patterns, called 'eco-graphic perforation,' enhances an eco-friendly look and feel.